Oldcastle introduces a revolutionary new way to install patio and paver stones - EZBase Patio and Paver Base Panels. 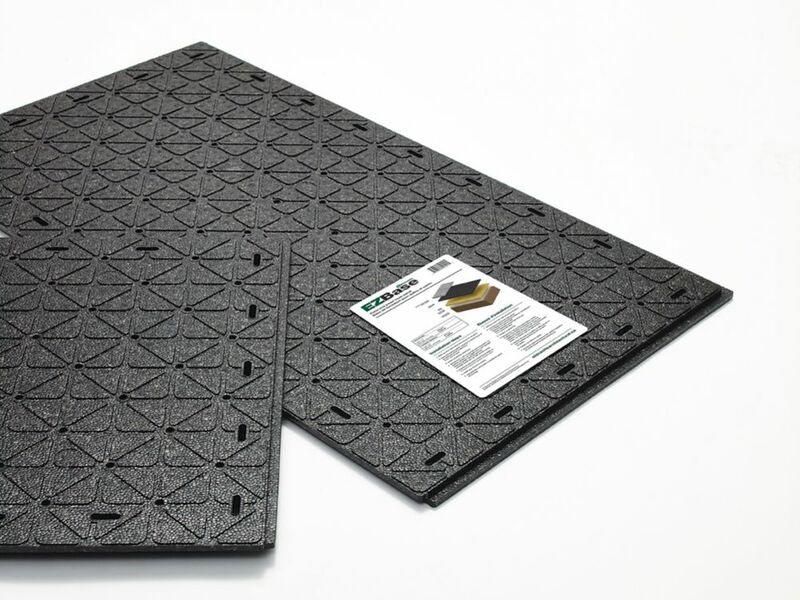 These easy to install high-density foam panels replace the need for a traditional compacted aggregate layer base system. The result is a patio or walkway that installs with less work, less expense and no special tools or materials to provide a stable base that is resistant to movement even in the coldest freeze/thaw climates. The foam panels are easy to cut and feature drainage holes and canals for water control and an overlap edge for stability. Quick and easy DIY installation. Easy to cut panels overlap for stability on a thin bedding coarse. Saves labour. EZBase requires only a thin bedding coarse so there is much less digging than traditional patio and paver installation. Saves time. No deep excavation and thick layer of aggregate to order and install. Saves money. No special tools to rent, no large loads of aggregate required for the base, no bins to rent and much less waste material to dispose of. A graceful marriage of beauty & practicality adds a gorgeous touch anywhere.A big LED bisque pillar candle has the look of a real wax candle with wavy edge and soft glow flicker, captivating and safe - Perfect for parties, holidays or any time you want to enjoy the glow of flickering candlelight; fabulous INDOOR & OUTDOOR decor.Let you enjoy the ambiance of candlelight safely without the actual danger of an open flame - Perfect for daily & festival lighting and decoration, any event or celebration (wedding, birthday party, anniversary, etc.) both indoors and outdoors. When the timer is not in use, just turn ON or OFF the lantern as a regular light. EZ Base 20-inch x 36-inch Panel Oldcastle introduces a revolutionary new way to install patio and paver stones - EZBase Patio and Paver Base Panels. These easy to install high-density foam panels replace the need for a traditional compacted aggregate layer base system. The result is a patio or walkway that installs with less work, less expense and no special tools or materials to provide a stable base that is resistant to movement even in the coldest freeze/thaw climates. The foam panels are easy to cut and feature drainage holes and canals for water control and an overlap edge for stability.